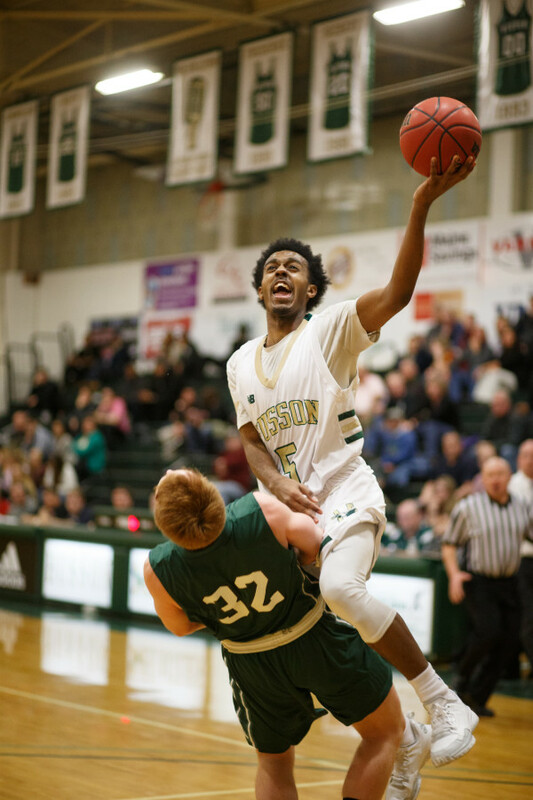 Trevon Butler (right) of Husson University collides with Castleton University's Kyle Adams on a drive to the basket during a game this season. The Eagles' senior forward from Waterbury, Connecticut, has overcome significant challenges on the way to being named the North Atlantic Conference Player of the Year for the second time in three seasons. 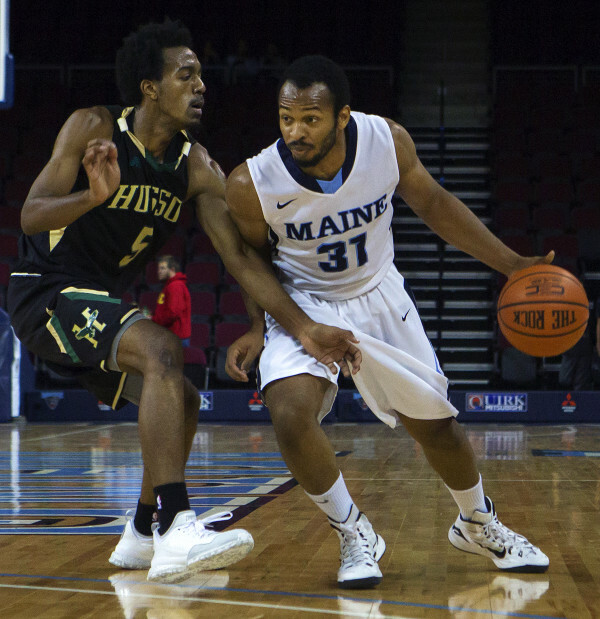 University of Maine's Troy Reid-Knight (right) drives the lane past Husson University's Trevon Butler during their exhibition game at the Cross Insurance Center in Bangor in November 2015. BANGOR, Maine — As a youngster, Trevon Butler used to plead with his mother to let him go outside and play basketball. His father, Keith Butler, had introduced him to the game and his uncle Maurice Chisholm had inspired him with his talents at nearby Wilby High School. “We would have a basketball hoop in the middle of the street,” Trevon Butler recalled of his neighborhood in Waterbury, Connecticut. Yet it was not all fun and games in the area, which was rife with drugs and crime. Lisa Chisholm didn’t want anything to happen to her only son. “You go outside and there’s gunshots, all of that stuff. It was really scary,” Butler said. Basketball opened the door for Butler to escape the streets of Waterbury. On Friday at 6 p.m., the senior leads top seed Husson University against No. 4 Thomas College of Waterville in the North Atlantic Conference semifinals at Newman Gym. “It’s win or go home, and if you’re not pumped up for that, you don’t belong here,” Butler said. “The most important thing is just finish off strong and have fun,” he added. On Thursday, Butler was named the NAC Player of the Year for the second time in three years. The versatile 6-foot-3 forward averaged 21.3 points, 7.6 rebounds, 2.8 assists and 1.7 steals per game for the Eagles (19-6), shooting 84 percent from the foul line. “His game is dynamic, and he can influence it in a lot of directions,” Husson head coach Warren Caruso said of Butler, who shoots 40 percent from the 3-point arc but can beat defenders off the dribble and set up his teammates. “He can score all over the floor, and I think that’s what makes him very dangerous, and we try to take that matchup wherever it suits us best,” Caruso added. Butler’s road to success has been full of challenges. At Crosby High School in Waterbury, he failed to make the varsity team as a sophomore and scored only six points in eight games as a junior. “It was frustrating. People made me feel like I wasn’t good enough,” said Butler, who finally earned playing time as a senior, when he averaged 7.9 points and 6.0 rebounds. After his graduation, Butler’s basketball career appeared to be over. He had not received any offers to play in college. “I was still at home, those long nights talking to my mom, crying,” Butler said. It turned out that Husson assistant Gus Ofili was from Waterbury and heard Butler was looking for an opportunity. Husson brought him in to join a team laden with experience and talent. As a freshman, he appeared in 13 games and scored a total of 25 points. “I wanted to quit, I’m not gonna lie,” Butler admitted. Butler’s perseverance and Husson’s strong support system made sure that didn’t happen. His teammates, in particular Corey Wood, encouraged him to be patient and to continue working on his game. “Tre had that fundamental drive and desire, and I think Corey really helped bring that out,” Caruso said. “That’s what this organization brings, a brotherhood to never feel alone. I tried to stay focused,” said Butler, who has tried to provide similar leadership as Husson’s only senior this season. Caruso said Butler put in the necessary work to get better and wound up surprising the coaching staff. Butler credits his family with providing the love and guidance to help him avoid succumbing to peer pressure in the streets of Waterbury, and to have the confidence to pursue his dreams. His father left when he was 10, leaving Trevon as the only male in a family of five that included his mom and sisters Shanay, Tameko and Shavonne, who is his twin. Butler said they were overprotective, but taught him what was important. Butler claims he has never smoked or drank alcohol, having witnessed what those behaviors had done to some of his friends and neighbors. “My thing was, I can still be cool and have a 3.5 GPA [grade point average]. I can still be cool and not smoke, drink, party,” he explained. When Butler was playing ball in the street, the drug dealers lingered nearby. Even they seemed to sense that there was something special about him. It was during the 2013-2014 season that Butler began to flourish. As a sophomore, he averaged 13.8 points, 6.8 rebounds, 2.1 assists and 2.1 steals, shooting 48 percent from the field, and was named the NAC Player of the Year. He helped the Eagles win the NAC title and advance to the NCAA Division III tournament for the second straight season. Butler goes into Friday’s game with 1,476 points, 607 rebounds, 193 assists and 149 steals in 95 career games. “He has a real internal desire to win and be successful and improve himself,” Caruso said. “It was done by hard work and dedication and really caring about the program and the people in it,” he added. Butler, a sports management major, looks forward to sharing his experience in overcoming the odds with young people. “I see myself working with kids at a boys club or something like that,” Butler said. He said the love of his family and the guidance and support he has received at Husson have been critical in his development as a person and as a basketball player. “The respect I have for coach Caruso, it’s out the roof,” he added. “I thank him for the opportunity to be here and be a part of this organization.